Beware - It's the Revenge of the Sand People! Ben Kenobi and Luke Skywalker must face off against mysterious warriors hellbent on warped justice! All those traveling in Tatooine - beware! For the Jundland Wastes hide a sinister secret. 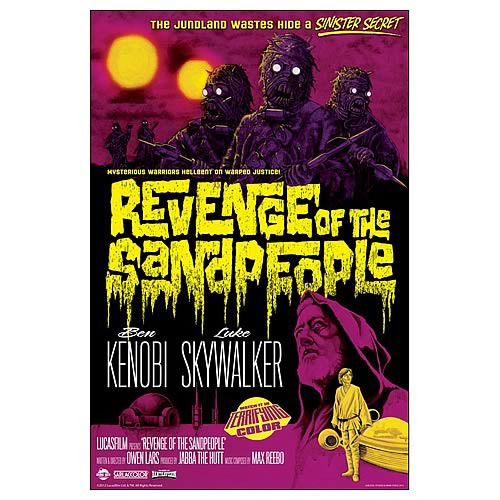 Ben Kenobi and Luke Skywalker team up in the sensational Revenge of the Sand People pulp horror flick! This Star Wars Revenge of the Sand People Fine Art Lithograph is a beautiful piece of artwork, commemorating Luke and Obi-Wan's struggle with the Tusken Raiders from Star Wars: Episode IV - A New Hope in a retro purple and yellow pulp horror poster style lithograph art print. This item is strictly for huge fans of the Star Wars series, with fake credits at the bottom like, "Written & Directed by Owen Lars. Produced by Jabba the Hutt," and a bunch of other little inside jokes sure to please true Star Wars fans. It's great! The lithograph measures 21-inches tall x 14-inches wide and is a limited edition of 750 pieces.